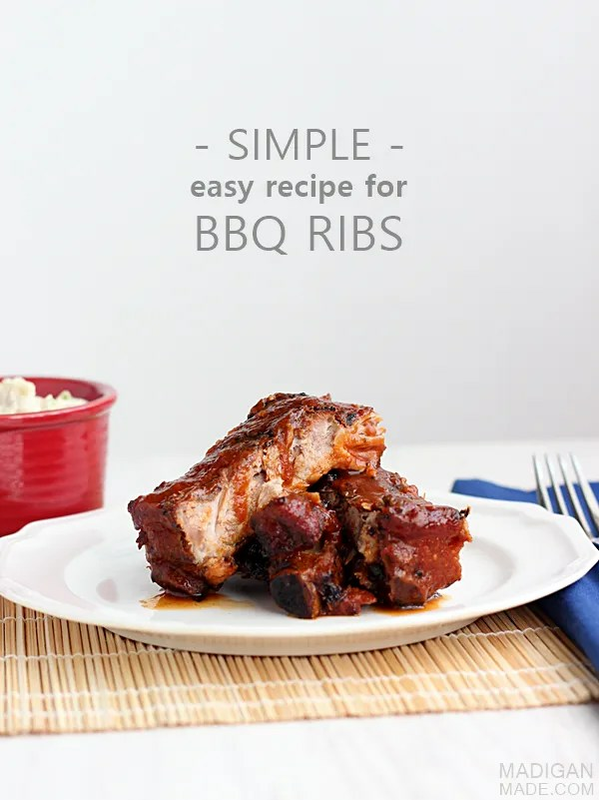 MAKE: an easy, no-fail recipe for BBQ ribs. The weather starts to get warm… we start using our grill… and hubby asks me to make these ribs. It’s like a pop-up timer on a turkey. When the temperature outside starts to get above a certain temperature my hubby’s craving for braised spare ribs sets in. And the rib begging does not stop all summer-long! Good thing these ribs are super simple to make. 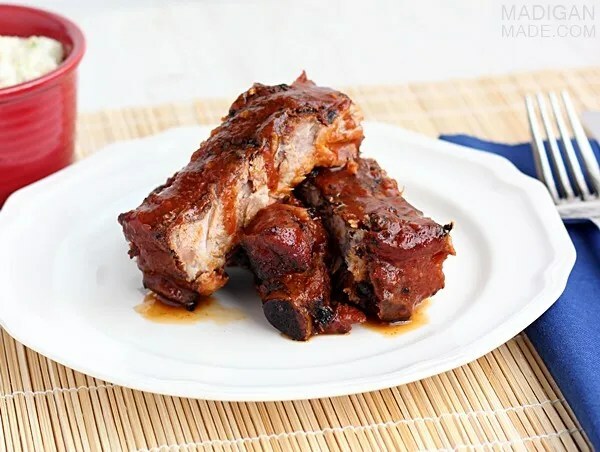 Really, they take very little ingredients, prep and effort… and the ribs come out tender and delicious every time! Need an easy entrée idea for your next Fourth of July or summer BBQ? Make these ribs! They are simple to make ahead for a crowd because you finish them off in the oven. You don’t need to be sweating over a grill as your guests wait for their meal. And the other bonus? There’s a bottle of beer in the recipe… ‘round here that is always a marker of a good summertime recipe! Adapted from this recipe at Wegmans. Preheat your grill on high. While you are waiting for the grill to warm up, rub your seasoning liberally over both sides of your ribs. 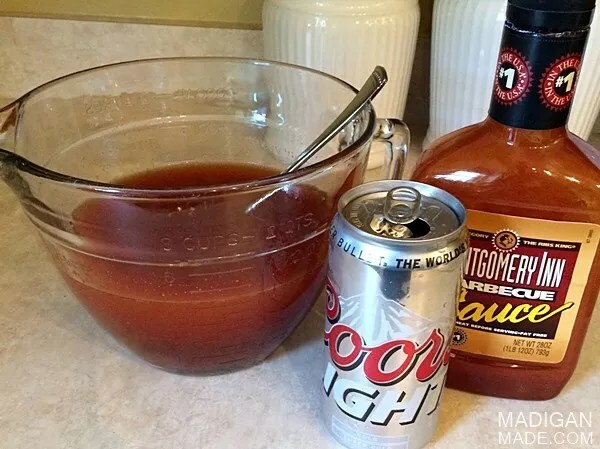 Also, while you are waiting… in a large bowl, whisk together your BBQ sauce and beer. Place your ribs on the grill and cook both sides for about 3 to 5 minutes. You are not going to fully cook the ribs, just sear and brown the outside. Transfer your ribs to a large roasting pan. You may need to cut the rack in half for them to fit in the pan. Pour your beer/sauce mixture over the ribs. Cover the pan tightly with tin foil. Bake for about 2.5 to 3 hours until tender. I’m telling you, these ribs fall right off the bone. 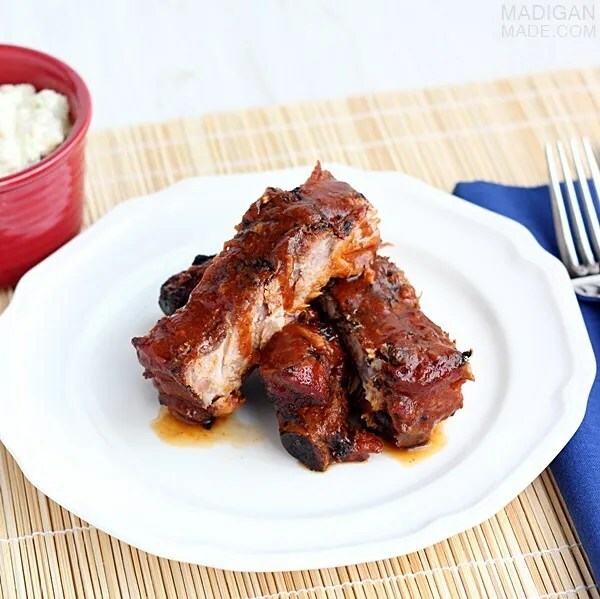 The only downside to making these ribs is that you might leave your family craving them again soon! But… considering how easy these are to make, that usually is not a problem in our house!